History buffs, this blog post is for you. The world is filled with interesting historic sites. Some are fascinating, others are mysterious and all have cultural significance. Regardless of the type of history you find interesting, there’s surely a historic site you may want to visit. Whether you want to experience natural wonders or architectural sites, the following world-renowned historical landmarks are at the top of the list for many people. Located in Agra, India, the Taj Mahal gets between two and four million tourists annually. Built in the 1600s, it is a white marble tomb that was built in memory of Emperor Shah Jahan’s favourite wife. One of the Seven Wonders of the World, it is a famous symbol of love, but you don’t really understand its true beauty until you see it in person. The best time of year to visit is between October and March. If you are planning on visiting, try to visit at sunrise or sunset to see the Taj Mahal is all its glory. Still a mystery, the pyramids are one of the most popular tourist destinations in the world. “Although it is clear the pyramids were used for the burial of pharaohs, the construction, date, and possible symbolism of the Giza pyramids are still not entirely understood. This mystery only adds to the attractiveness of these ancient wonders and many modern people still regard Giza as a spiritual place,” says Best Toppers. The pyramids are now more than 4,000 years old, making them the oldest of the Seven Wonders of the Ancient World. You can visit anytime of the year, but note that the summer (May to September) can be extremely hot. 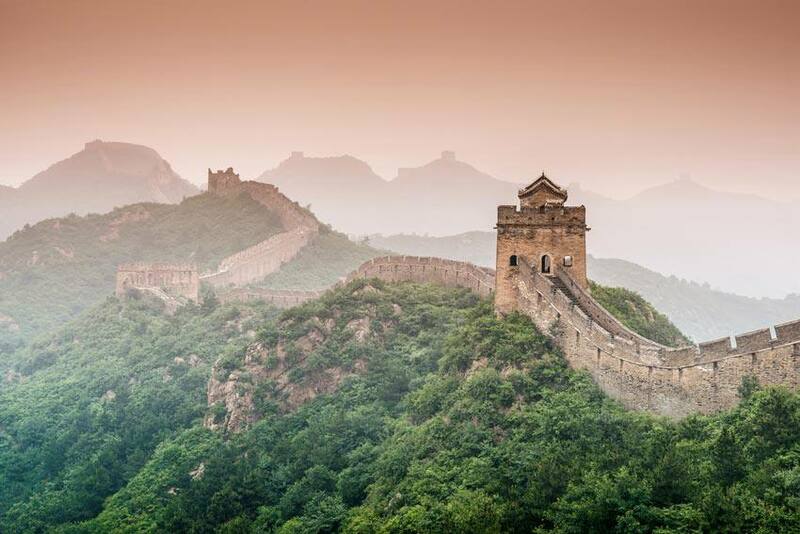 Built and rebuilt for centuries, the first walls were erected in 7th century BC. During the Ming Dynasty, it became one of the largest military structures in the world. The Great Wall is perhaps most famous for the fact that it can be seen from space, making it the single greatest engineering feat. Since the Great Wall stretches thousands of kilometres, there are many access points. The most popular are Badaling, Juyongguan and Mutianyu, all of which can be accessed from Beijing. The best time of the year to visit is May, September or early October. Located in southern Peru, Machu Picchu is a unique historic city that sits on top of a mountain. The city is only accessible by train or by a four-day trek up the mountain. It is culturally significant for the Inca civilization, and it was only rediscovered in 1911. Completely self-contained, the city is invisible from below. It was deemed to be one of the Seven Wonders of the World in 2007. If you plan on visiting, it is recommended that you go in May, after the rainy season and before the tourist crowds, or in September, after the tourist season. Perhaps the most famous of the many historic sites in Athens, Greece, the Parthenon is the ancient temple dedicated to the goddess Athena. Built in 447 BC, it is regarded as a symbol of power of Greek civilization. With stunning views of Athens, ruins and temples, it is a must-visit if you are in Athens. The best time to visit is late winter and early spring, before the tourist season begins. The Colosseum is a must-visit if you plan to travel to Rome, Italy. It is world-famous for its historical context and architectural beauty. Even though some of the structure has eroded over time, it is still a breathtaking sight. “These sites are breathtaking not only for their beauty but also for their history and age. You’re standing in the spot Caesar walked and gazing into the arena where gladiators battled to the death,” says travel writer Nomadic Matt. Built in the 1st century AD, the Colosseum could accommodate 45,000 spectators and held gladiator combat, events with wild beasts, and is believed to be a place of martyrdom. If you want to avoid the crowds, it’s recommended that you visit from November to February. One of the most eerie and mysterious historic sites in the world, Easter Island is world-famous for its hundreds of monumental statues. Located on the Chilean island in the Pacific Ocean, the statues, called moai, were created by the Rapa Nui people. The statues are the only thing that remain from the culture that once lived on the island. The statues are carved out of volcanic rock, and the island also is filled with stone walls, stone houses and caves. The most popular time to visit is December to February, but if you want to explore with fewer people around, consider booking your trip in October, November, March or April. Christ the Redeemer is the largest art deco statue in the world. Standing at almost 40 metres tall and weighing 635 tonnes, it is located at the top of Corcovado Mountain. The statue has become a symbol of Brazilian Christianity and is one of the best places for viewing Rio de Janeiro. December to March is the best time of the year to visit the statue. Located close to Salisbury, England, Stonehenge is a mystical stone structure that is more than 3,000 years old. “Stonehenge is composed of a circular setting of large standing stones set within earthworks. It is at the centre of the most dense complex of Neolithic and Bronze Age monuments in England, including several hundred burial mounds,” says Best Toppers. Unfortunately, tourists can no longer walk inside the inner circle. The best time of the year to tour Stonehenge is in October or April to early July. Located in Jordan, Petra is an archeological city that is carved into the side of Mount Hor. It is believed that the city was created in 6th century BC and was known as the capital city of the Nabataeans. Many people may recognize Petra, as it was the site for the filming of the third Indiana Jones movie. The best time of the year to visit is October to December. If you plan on visiting any of these or other historic sites, don’t leave home without reliable travel insurance. It will be a travel experience you won’t soon forget!